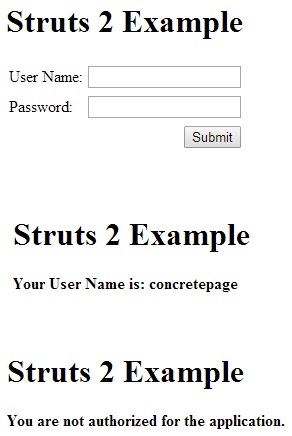 In this page, we will learn how to create an application in Struts 2 using XML configuration. For the example we have taken a login application. Struts 2 applications can be created annotation based and xml based. In xml based application, the actions and responses are configured in struts.xml. The JSP page which needs to be redirected after run the action is also configured in struts.xml. To create and run the demo we have used below software. 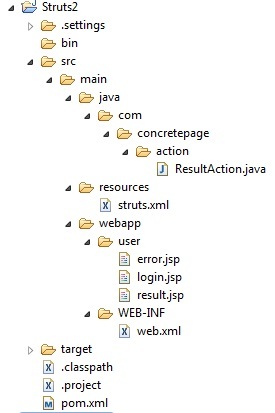 In struts.xml, within the <struts> tag define the namespace, action class and jsp pages which will be redirected. Create web.xml for struts 2. Configure StrutsPrepareAndExecuteFilter so that request and responses can be filtered according to struts application. I have created one action class ResultAction.java which consists two property and a method as execute(). The properties are used to populate data from jsp. Execute method is the method from where action class starts executing. Find login.jsp which will be displayed first on accessing the demo. The properties defined in action class and input fields name of jsp must match in their name. Find result.jsp which will display data when login is successful. Using properties of action class, values can be fetched on JSP. Find error.jsp which will display message when login not successful. I have configured login application in eclipse in below structure. Find the maven dependency for struts 2. Use URL http://localhost:8080/Struts2-1/user/login to run the application. Find the Login Page. Enter any username and enter password same word used as user name, then we will get success page and if differ will get un authorization page. Find output screen.